This cardigan works like a coat, adding instant flair to any outfit. Its oversized collar can be worn up around your neck for warmth or open for drama. The k4, p2 rib gives sleek vertical lines which - surprise! - emerge from an angled front. Sew on buttons where you like on the opposite front to create a custom fit. GAEA is a 100% merino, which knits up to gauge with a firm bounciness. 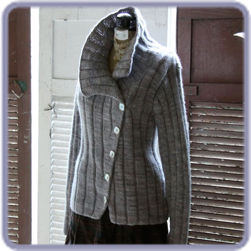 A Moonstruck made from Gaea will have the stability of a jacket with the warmth of a sweater. Wearable indoor and outdoor (outdoor for spring and fall). WOOBU and PERU held together create a shimmery, lustrous sweater. The Woobu takes up dye a bit differently than our 100% wool yarns, so the resulting colorways are more muted and grayed. A Moonstruck made from Woobu and Peru will be drapey and lustrous, with the silky breathability of the bamboo fiber balanced out by the soft warmth of the alpaca. MOPSY is our angora blend that manages to be cozy soft without becoming too hot. Knit to the gauge for Moonstruck, Mopsy fabric is very soft and swishy, and lends breathability to the angora content. Be sure to wet-block or wash your swatch and check your washed gauge – Mopsy opens up quite a bit with washing! A Moonstruck knit from Mopsy will be very fluid and sport a fine halo from the angora. Not a windblocking fabric, but an elegant, soft knit.